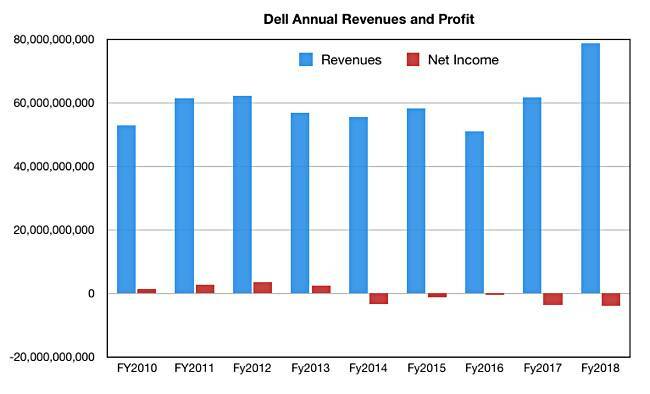 Dell had a reasonable fourth 2018 quarter in all areas but one – storage. Yes, EMC let the house down with an 11 per cent drop in revenues year-on-year. Total Dell Technology revenues were $21.94bn in the quarter, a 9 per cent rise on the year. Net income was -$533m, a big improvement on the year-ago -$1.4bn. Why was ISG's growth rate a lowly 5 per cent? Storage let the side down, contrasting starkly with the 27 per cent growth in servers and networking. In servers Dell saw double-digit growth from both PowerEdge and Cloud servers, along with ongoing expansion of its server ASPs. In fact server and networking revenues exceeded storage revenues this quarter. We exited the year with growth across all of our segments, with particular strength in commercial client and in servers and networking. In addition, we saw demand growth up double digits for all-flash and triple digits for hyperconverged infrastructure in the fourth quarter, and we see a significant opportunity to ignite momentum in traditional storage in fiscal 2019. HCI and AFAs did the business growth, with demand for all-flash exiting fiscal 2018 at a nearly $5bn run rate. Disk and hybrid arrays, software-defined storage and data protection products implicitly did not. Dell said it grew its PC unit share year-on-year for the 20th consecutive quarter. Commercial client revenue was up 9 per cent year-on-year due to ASP expansion for notebooks and workstations as well as double-digit revenue growth in displays. Mobile workstations and Latitude grew in double-digits in both units and revenue. Dell became the #1 provider of workstations worldwide, according to IDC. Consumer revenue was up 6 per cent year-over-year with growth in ASPs for both notebooks and XPS products. Full fiscal 2018 revenues were $78.7bn, a 27.6 per cent rise on the year-ago $61.64bn. Net income was -$3.86bn, slightly worse than last year's -$3.74bn. 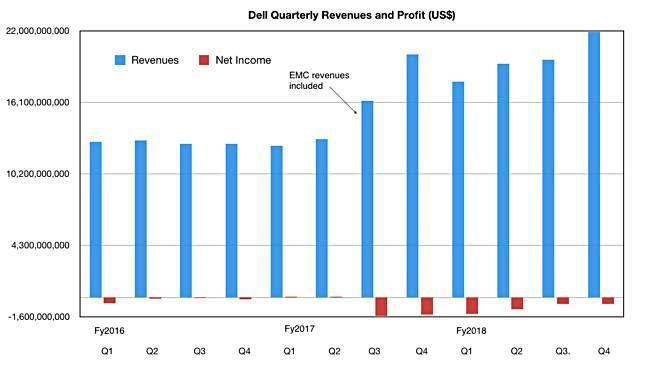 However, Dell notes: "Prior-year historical Dell Technologies financials do not include EMC historical results for the first and second quarters and a portion of the third quarter in fiscal 2017, thereby impacting any year-over-year comparisons for the full year. EMC results are included for the full fourth quarter of Fiscal 2017, thereby year-over-year results are comparable for the fourth quarter." Dell says it has paid down $10bn in debt since the EMC acquisition transaction closed and had a $6.8bn cash flow from operations. CFO Tom Sweet said: "I was pleased with our results in fiscal 2018. We finished the year with good revenue and profitability momentum, with non-GAAP operating income up 15 per cent year-over-year. We drove velocity at or above market rate in multiple areas of the business and generated strong operating cash flow." In fiscal 2019 Dell says it wants to grow above the market and drive share gains, with a particular focus on storage and client. It wants to increase profitability in ISG "as we balance server velocity and profitability, and accelerate storage and data protection velocity".